Sony has been facing problems with its security measures lately with its recent flagships Xperia Z1, Xperia Z1 Compact and even the upcoming Xperia Z2 ‘Sirius’ or D6503 having leaked extensively. We have always known most of their specs even before they are official and now Sony is trying to step up some of its security and it has started that by banning benchmark apps to run on its prototype devices. Reportedly, the software on prototype Sony devices will no longer let folks run benchmark apps, there’s even proof for it. 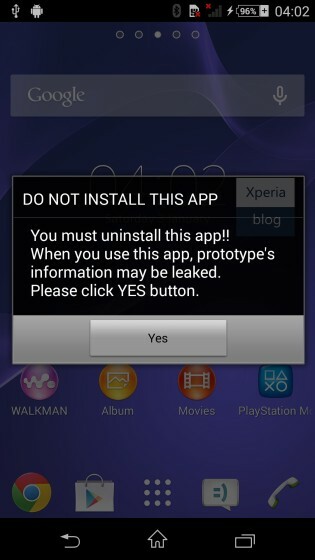 The screenshot above is taken from a prototype Sony device and as you can see the software suggests the user to uninstall the app. While it may seem like a warning but it’s not, the user got this warning while he was installing a benchmark app and it’s not just a warning but it blocks the installation. We all know that several devices leak through the benchmarking apps as these apps also reveals the specs of the device which are tested upon them and Sony might be trying to block this way of leaks but will the leaks stop? The answer is obviously no as this is not the only way devices leak so only blocking benchmark apps will not do a whole lot of good for Sony.